no ammonia | hassle free Creme sachet.Enriched with Olive Oil, Aloe Vera & Green Tea extract.25%..
With millions of women around India and the world trying to achieve a new look and cover greys by coloring their hair, there is a pending need of a safe, chemical-free hair color offers a real alternative for those who want good color, perfect coverage and healthy-looking hair. There should be no compromise when it comes to your hair. This is why one should ammonia free hair colour. If you think it’s a passing trend to choose something more natural and nurturing, you may be mistaken. Hair colour without ammonia is not just a passing trend but a better and healthier option for your hair. When you can get the same or even better results, it is better to choose herbal hair color that protects and nourishes your hair. 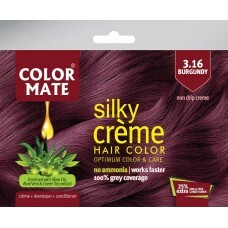 Trust Color Mate, one of the leading ammonia free hair color brands in India. Color Mate is a brand that provides superior quality ammonia free hair colours that are enriched with the goodness of natural henna and several other nature’s herbs. With more than 30 years experience in the industry, Color Mate brand wants to become a forerunner in ammonia free hair color brands in India by offering genuine hair colors that are a result of deep research. But what’s the reason for this? Is ammonia harmful? Ammonia actually breaks through the hair cuticle to deposit color. It damages hair structure, extracts water out from the cells, leaving your hair dry, undernourished and damaged. Many other established brands promise a control on their content of ammonia but why take a risk when there is a more natural and safer way to color hair? Organic chemical free hair color from Color Mate does not penetrate the hair follicle but coat the hair with the color you choose. It’s Power Shield Formula will help maintain the structure of hair, retains moisture and boosts the health of your hair. Why Use Colours from Ammonia Free Hair Colour Brands? There are five main reasons why natural chemical free hair color has developed such a following among hairdressers and clients alike. Calm color: Ammonia-free hair colors have extra mild chemical properties. This is great news for those with sensitive skin and hair that are tired from their previous branded hair color. It’s always good to be on the safe side. Protection and shine: Healthier hair means softer, smoother and improved hair quality. Thanks to the Color Mate’s unique nourishing formula. It not only infuses the hair with nourishing oils to give it a silky smooth finish but protects the hair’s natural moisture levels, preventing dryness and prolonging your color. Grey coverage: Color Mate gives semi-permanent color that offers up to 100% blending, meaning that it’s an ideal solution for subtly covering any unwanted white or grey hairs. You could also take the opportunity to ask for a multi-tonal finish which can make thin, ageing hair look thicker and healthier. Look natural: These days, the key hair color tendency is all about having a natural looking finish. This is why neutral shades like black and brown hair have become so popular. No pungent Odors: Color Mate’s products contain no ammonia so it doesn’t have that strong smell, taking the hair coloring experience to a new level. It makes the act of hair coloring an enjoyable moment that both you or your hairdresser can take pleasure in. Don’t search too far for safe hair color brands in India. Color Mate utilizes unique color formula and provides a range of hair color products that incorporate goodness of Himalayan herbs, Natural Oils, Olive Oil, Aloe Vera and Green Tea extract. Color Mate brand offers the most reliable chemical free hair color in India that has once and for all removed the need for ammonia in hair dye. But it does works like any other hair color. Gives your hair an even finish. The formula does not drip. Color remains vibrant for a long time. With Color Mate’s range of exclusive hair colors easily available online, your search for the best one out of the safe hair color brands in India stops here. We have a wide variety of ammonia free hair colours available at Color Mate. Golden brown is your best bet if you want to try out a light color but have extremely dark hair. The black and brown tones of your hair after pre-lightening will only highlight the dye instead of cancelling it out. Dark brown is one of the most popular choices when it comes to natural shades. This amazing style fades from dark black to a deep brown. Natural black is a popular choice for both men and women with brown or grey hair but this natural looking black color will keep you completely fascinated. If you have black hair and want an interesting color that will flawlessly balance out of your natural hair, this is one for you. Color Mate’s ammonia free hair colour range provide great color and nurture your hair with deep nourishment via herb extracts and natural oils. The different ingredients strengthen your hair while coloring it, giving the ultimate shine. Enjoy your soft and silky hair with color that gives full grey coverage along with a natural finish.